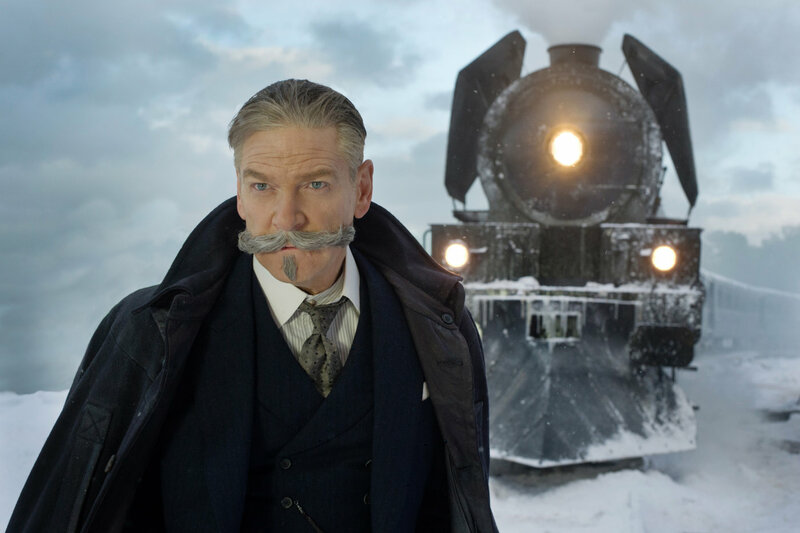 Hollywood’s current love affair with tried-and-true franchises chugs along with the latest rehashing of murder-mystery writer Agatha Christie’s widely read novel, MURDER ON THE ORIENT EXPRESS. This reincarnation is directed by Kenneth Branagh (DUNKIRK) and stars, along with Branagh’s uber-elaborate prosthetic moustache, a bevy of Hollywood A- and B-listers including Johnny Depp (the FANTASTIC BEASTS franchise), Michelle Pfeiffer (MOTHER! ), Judi Dench (SPECTRE), Daisy Ridley (the new STAR WARS franchise), Derek Jacobi (GRACE OF MONACO), Willem Dafoe (JOHN WICK; THE FAULT IN OUR STARS), Josh Gad (BEAUTY AND THE BEAST), Leslie Odom, Jr. (TV’s SMASH), Lucy Boynton (SING STREET), Olivia Colman (THE LOBSTER; TV’s PEEP SHOW), ballet dancer-turned-actor Sergei Polunin and Penelope Cruz (VICKY CRISTINA BARCELONA). As in previous versions of the story, Belgian Hercule Poirot, the world’s greatest detective, is in Jerusalem solving the mystery of a stolen Christian artefact. No sooner does he sort that matter out, then he is asked to go to London to solve a case there. To get there, he decides to sail to Istanbul and then board the Orient Express. Strangely, even though it’s winter, the train is fully booked and, for the first night, Poirot has to share his quarters with Hector MacQueen (Gad), who is the accountant to gangster Edward Ratchett (Depp), who is also a passenger on the train. (The circumstances regarding Poirot getting a private berth on the second night left me a bit confused but that’s neither here nor there.) As the train climbs into the mountains of Yugoslavia, an avalanche literally stops it in its tracks. Ratchett is found stabbed to death in his berth and someone on board the train did it. Could it be MacQueen? There is no shortage of suspects including the widow (Pfeiffer), the princess (Dench) or her lady’s maid (Colman), the governess (Ridley), the butler (Jacobi), the professor (Dafoe), the doctor (Odom, Jr.), the humble missionary (Cruz), the hot-tempered count (Polunin) or his drugged-up wife (Boynton), or even a few others. Now, Poirot has to figure out who did it before the murderer strikes again. If you haven’t read the book or seen the now-classic 1974 film that was directed by Sidney Lumet and starring Albert Finney as Poirot, you will probably enjoy this version. Branagh does a competent job keeping the story moving along and he does make for an amusing detective, though his moustache can be very distracting. However, the film doesn’t do much more than that. With the exception of Branagh himself who seems to be hogging the spotlight in every scene, the actors get little more than a few minutes each to tell their stories and give us a peek into their backgrounds and motivations. As a result, by the time the grand reveal happens, we’re barely interested in any of them and we’re indifferent to the motivation that led to the murder. It all adds up to being rather average fare. Perhaps it was all the CGI that was used. It’s obvious (at least to most of us) that it was filmed on a sound stage. That’s right – those pristine mountain passes covered in snow were all done on a computer. It all looks too perfect and, because of that, the film lacks authenticity. At the very least, Branagh should have thrown in a clickety-clack or two as the train moved along. For 1933, that was one very quiet and smooth ride! To screenwriter Michael Green’s (BLADE RUNNER 2049; ALIEN: COVENANT) credit, this version includes people of color whereas Lumet’s cast and even the 2001 made-for-TV cast were both decidedly white. But is it enough to warrant seeing the film? My advice is to wait for this who-done-it to come to TV or catch it on an airplane. Watch the review recorded on Facebook Live in RTHK Radio 4’s studio on Thursday, November 30th at 8:30 am HK time! I didn’t like Branagh as Poirot at all! He was too good looking, too thin and too nostalgic to be the funny, sarcastic, pragmatic and matter-of-fact Hercule Poirot. Not too mention that he didn’t emphasised his love for cakes enough during the movie – if I recall correctly, there was only one brief situation. I was not convinced and much prefer the book.